The RLFAA024-01 Rescue Laser Flare® Magnum is a hand-held day and nighttime laser signaling device that provides a convenient, effective way to signal a rescue party. Its waterproof, rugged design combines the safety of a laser signaling device with the convenience of a flashlight. Most popular model with mariners! Unlike pyrotechnic flares, the Rescue Laser Flare® Magnum is non-flammable, environmentally safe and can operate continuously for 72 hours on a two easily replaceable AA batteries. Two standard alkaline batteries include. Lithium AA batteries can be substituted in sub-zero conditions. Includes a SIGHT RING to help aim at your target! For customers outside of the USA, please purchase through one of our Authorized International Dealers. Greatland Laser, LLC (Greatland) warrants to the original registered owner that this product is free from defects in parts and workmanship for the life of that owner. To qualify for this warranty you must complete and return to Greatland the printed warranty registration form. Greatland or an authorized Greatland service provider will repair the product or, at its option, replace a defective Rescue Laser or any component thereof free of charge. This warranty is in lieu of all other warranties and conditions, express or implied. EXCLUSIONS: This warranty does not cover any of the following: 1. Battery exhaustion; 2. Battery leakage; 3. Lens damage; 4. 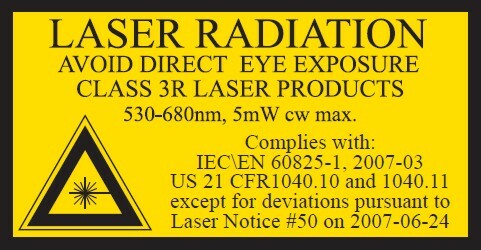 Damage to or failure of the Rescue Laser or any component thereof due to alteration, misuse, battery leakage or lack of maintenance. GREATLAND DISCLAIMS ANY RESPONSIBILITY FOR INCIDENTAL OR CONSEQUENTIAL DAMAGES: Under no circumstances is Greatland Laser, LLC, its officers, employees, agents or affiliates, liable for any loss, damage, or expenses of any kind arising out of the use or inability to use this product. Some jurisdictions in Canada and the United States do not allow exclusion or limitation of implied warranties, incidental or consequential damages and/or imitations on transferability, so the above limitations and exclusions may not apply to you. In Canada and the United States this warranty gives you specific legal rights, and you may have other rights which vary from state to state and from province to province. Where any term of this warranty is prohibited by the law of any jurisdiction, such term shall there be null and void, but the remainder of this warranty shall remain in full force and effect. This product works well at night. The broad light, rather than a tight beam, makes it less likely to blind a rescuer, and more likely to be seen. It reportedly does not work as well as the green laser, but the price difference makes the red laser a better value-for-money choice for me. Unfortunately it is not a good solution during the day, when something like smoke flares or a simple mirror might work better. Do not hesitate to buy! This is one fine instrument, well made. The Greatland Laser will do what it is supposed to do and do it well. A fine and unique product reasonably priced, friendly service, shipped timely, well packaged. And a no nonsense Warranty. What else would I want from this great bunch of folks at Greatland? Nothing! You did it ALL RIGHT. Many Thanks & Much Appreciated!